Back in 1981 when I was in senior high school I studied the subject about world history. That included histories of ancient civilization of Egyptian Pharaohs and Its Civilization, Machu Pichu with Great Mayan civilization, Borobudur of Java, Great Wall of China, As well as The Hanging Garden of Petra. It was a very interesting subject but as a high school student, I did not realize how great these momentous eras were. In 1989 the released of Steven Spielberg movie ‘Indiana Jones and the Last Crusade’ from Paramount Pictures took place in several countries including here at Petra, Jordan. I did not give so much attention about the location shoot, but I enjoyed the adventure of Harrison Ford as Indiana Jones, travelling to the ancient world to find ‘mysterious’ things as what most of the Indiana Jones story plot is set - to go to unknown ancient places, and what interest me most was watching the scenes on all trapped places, magic spells, unusual creatures, etc. After my four years mission in Cambodia, my next destination took me to Sharm El Sheikh in Sinai Peninsula of Egypt. This was my dream since 2006 - to visit this country. Earlier before I am flying from Indonesia, I bought some books about Egypt and Jordan in one of the bookstores in Jakarta, and since then I started to learn about ancient civilization. About the image above: a local man on a horse, transportation to the sites. 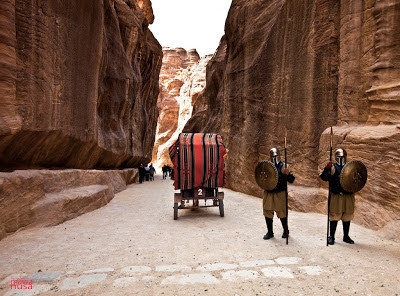 After arriving Egypt, I started to learn more about the map surrounding Egypt and I saw the country Jordan and then I look upon this interesting place called Petra. I asked my colleague how far is that place. 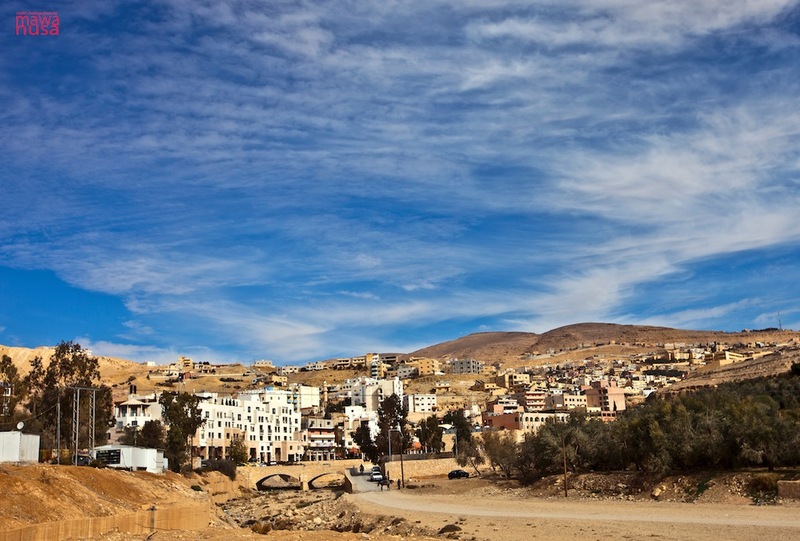 One problem was I do not have a visa to cross the border and I asked my agent on how to arrange the visa and I was very lucky that I do not need a visa since I have an Egyptian visa so I can just get on the boat when I cross the border to Aqaba. That was great! 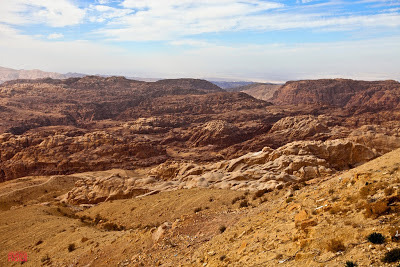 And so I decided to have a day trip to Petra from Sharm El Sheik. The journey took about 6-7 hours, with an English-speaking tour guide and my journey has begun. At about 01.30 past midnight the driver picked me up from the hotel where I stayed. 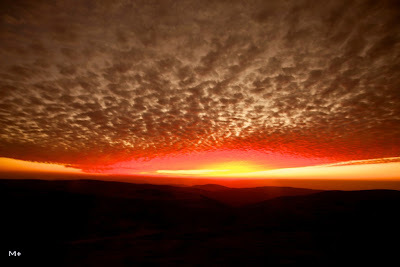 I have my camera, bag, tripod, drinks and some light food and sandwiches for the long trip. 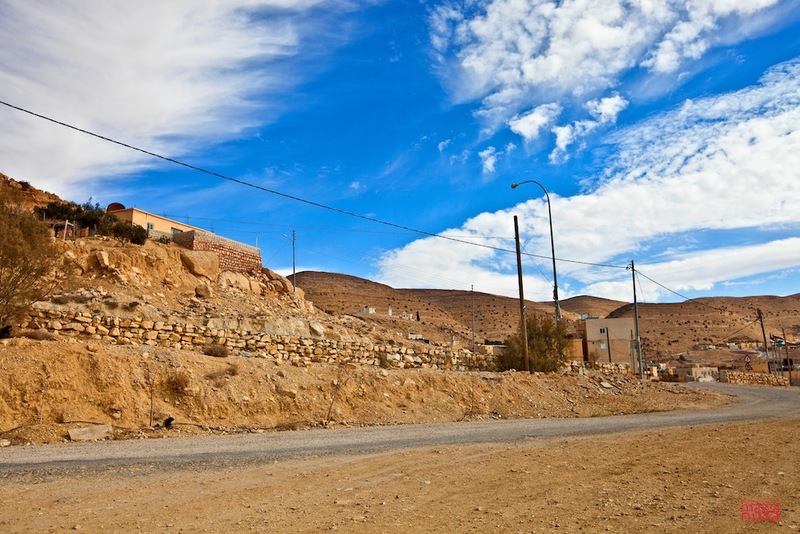 The way from Sharm El Sheik to Nuweba near Taba (still in Sinai, Egypt) took about one hour and forty five minutes. After waiting for a short while and completing the immigration passport check, I boarded a ferry boat to cross the Arabian sea to Aqaba, and the trip took about one hour and thirty minutes. The trip on the boat was fun with the crew, we can also order some nice coffee and tasty snacks. 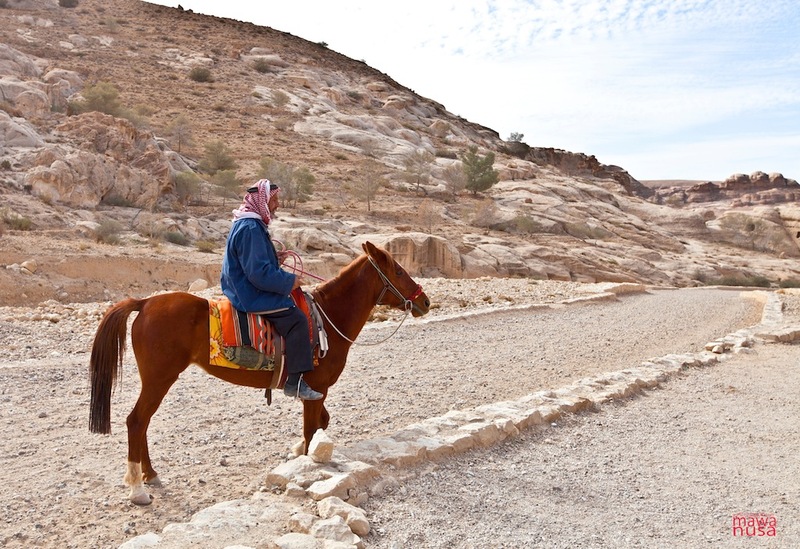 I arrived at the Jordanian soil at about 5.30 in the morning, and my English-speaking guide picked me up and escorted me to the car to transport me to the destination of my dream – Petra! 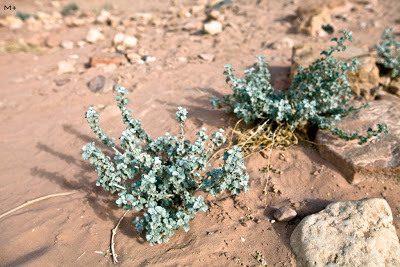 On the way to Petra, there were many fascinating things I captured with my lovely camera, I can see the morning life in the city of Jordanian desert slowly unfold before my eyes. People in the villages started their early activities, cultivating grains on a very dry soil. 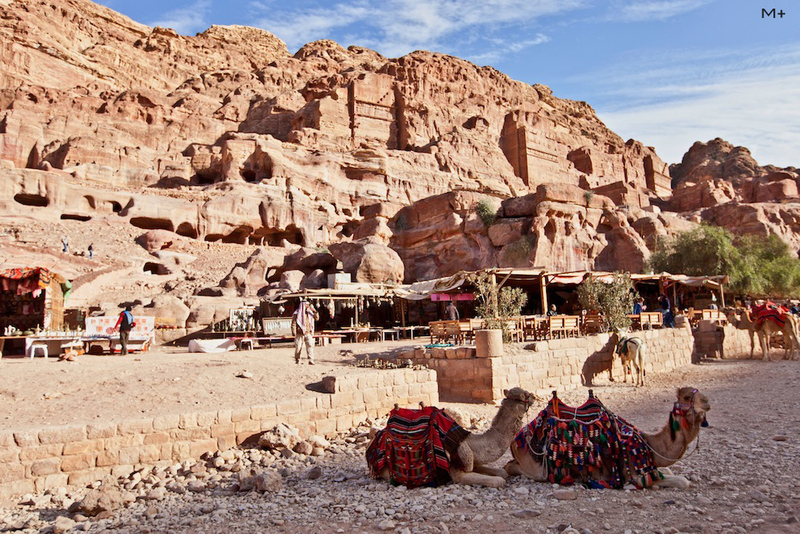 It took about two and half hours before I reached the site and in between, we stopped shortly to have some morning treat, a Jordanian coffee with toasted croissant and honey in a coffee shop facing the Petra village. The view was amazing and I was so excited to see how beautiful this place is. I changed some money to Jordanian Dirham just in case I need to buy some souvenir or something in the site. 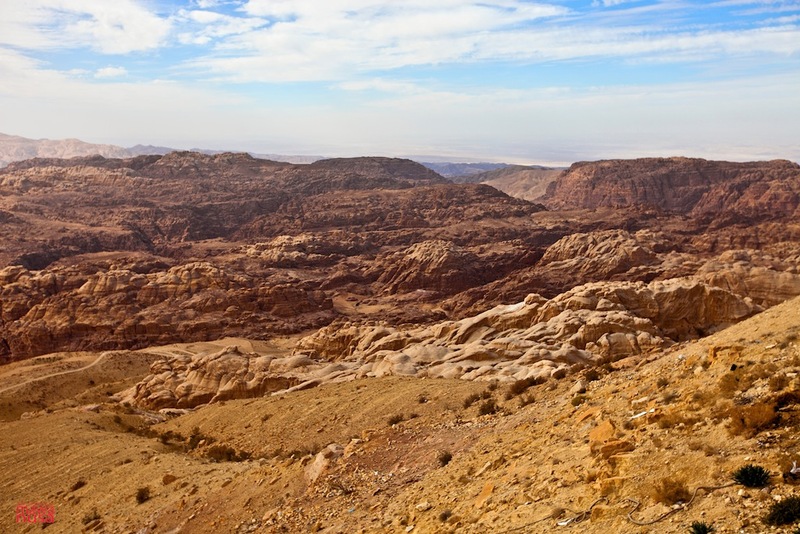 As we were closely approaching Petra, my guide showed me from where I can see Petra in an almost aerial view where the scenery was absolutely breathtaking! 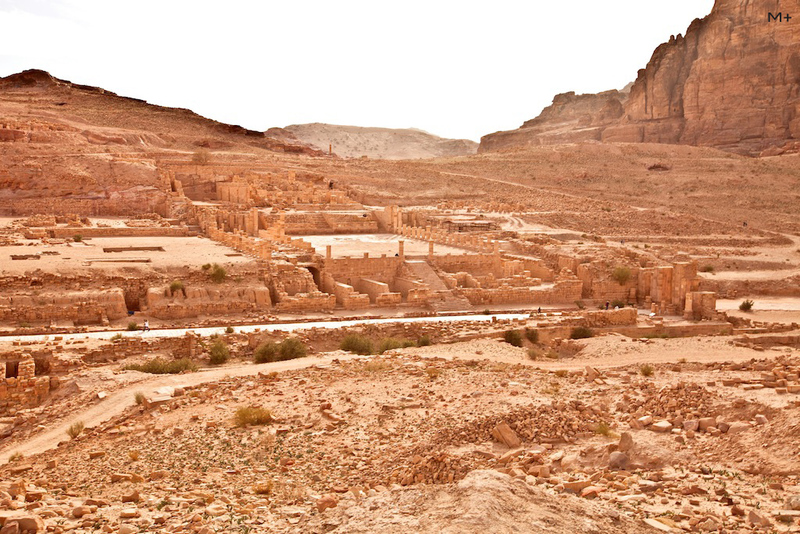 We then reached Petra and bought the ticket to enter this magnificent site. 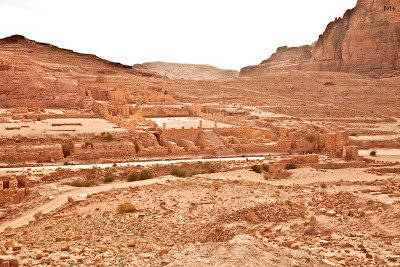 Then my guide started explaining about Petra, how was the civilization looked like during that great era, I actually knew some information about it as I have read it earlier. 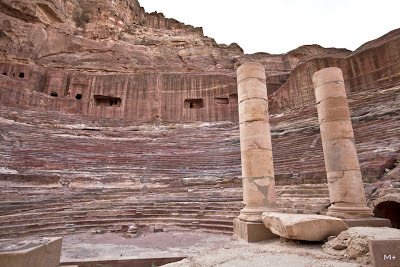 Petra or ‘Al Batra’ in Arabic is located in Ma’an Governorate, Jordan. 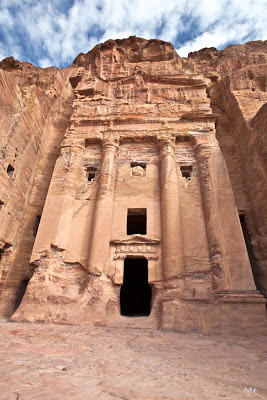 Petra was announced on 11 November 2011 as the new seven wonder of the world and has been voted by over 14 million voters. 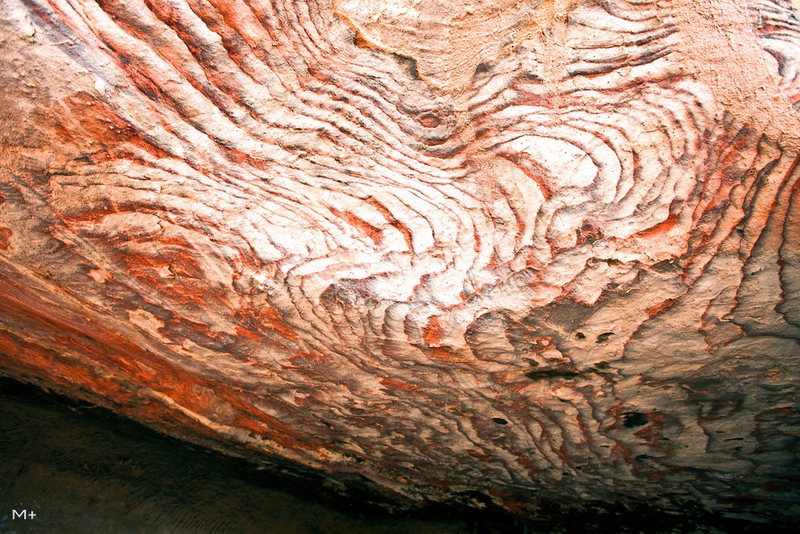 It is famous for its rock cut architecture. Petra established for settlement during the 6th century B.C. 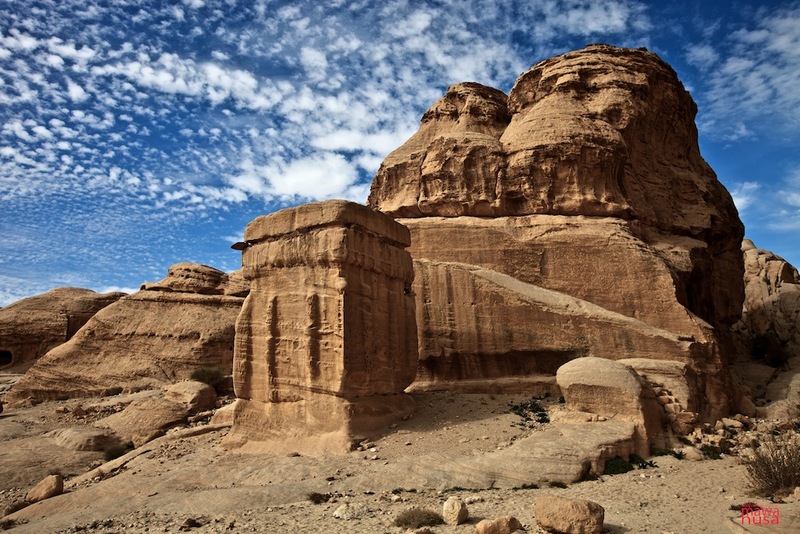 as a capital city of Nabataeans. But the culture of the wonder of fine rock-cut carving was only established about 1550 B.C. or maybe they started a bit earlier with some simple carvings for the purpose of preserving their mummies and tombs for their ancestors. About a century since the 1st century B.C. 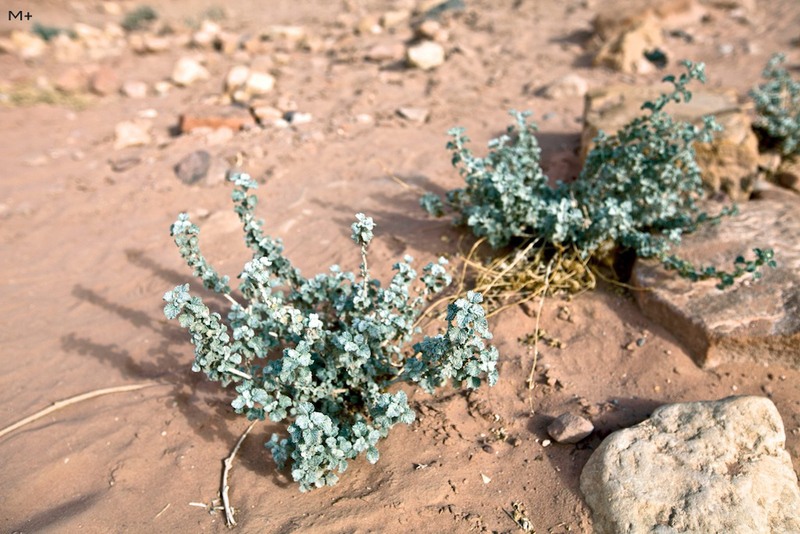 Petra marked and indentified itself at one of the cosmopolitan in this peninsula of the desert trade road. This is a golden road reaching the red sea for the journey to the ancient Egypt. Few explorers described this place as a special place that will last forever like John W. Burgon wrote and included in his poem as ‘a rose-red city half as old as time’. 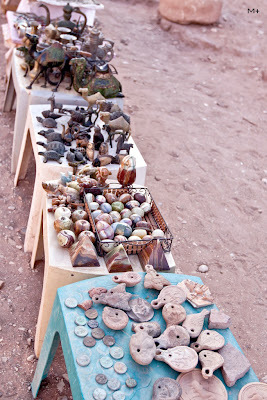 UNESCO described as ‘one of the most precious cultural properties of man’s cultural heritage’. BBC chosen it as one of ’the 40 places you have to see before you die’. 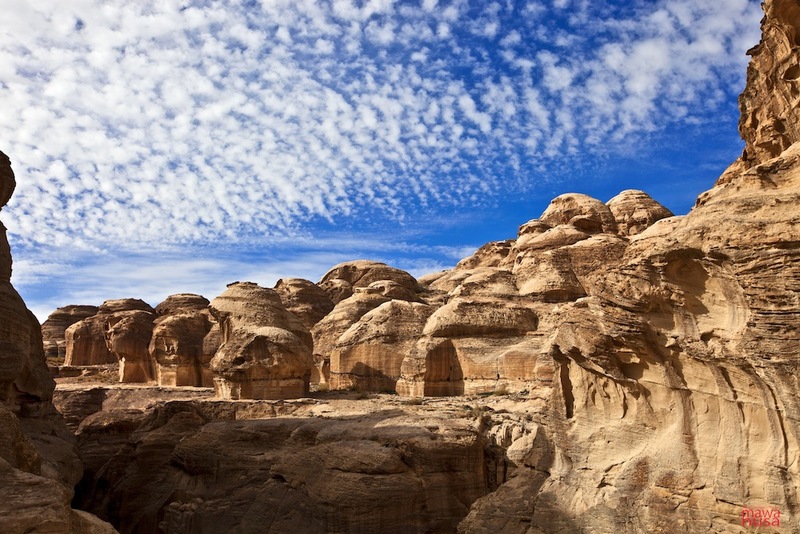 The introduction of Petra by a Swiss explorer named Johann Ludwig Burckhardt to the world in 1812 helped to promote it and since then many travelers and adventurers visited this site. Fabio’s guidebook really help me a lot on this trip as I am not familiar with the place but with this book I was able to find and discover almost anything in Petra without further explanation from my tour guide. What Fabio has written in his book was absolutely true and I have almost the same feeling when I visited Petra. No other places as magical as Petra, these rock-cut monuments are really incomparable treasure to other ancient monuments in the other parts of the world. 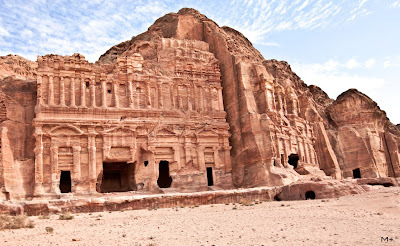 I have visited many ancient temples in Asia, India and Egypt, and Petra is completely different, the laser precise of rock-cut carving is really amazing, and on that period of time, who else among the vast span of human civilization can do this epic job but only the Nabataean did it! Besides that, the rocks are pink in color, in some places the rocks are so colorful with a kind of rock-layered, beaming with variety of colors, just like painted naturally which makes this place even more exquisitely stunning. 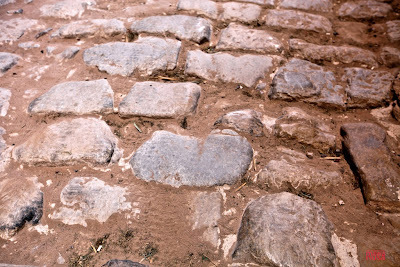 So because of the pink-reddish colors of the rocks some text called this site as the ‘pink city’. Djinn Blocks are three blocks of rocks about 5-9 meters high that can be seen easily after entering the entrance. It is a cube-shape stone carving that was carved on the 1st century B.C. and looked like the tombs of monolithic cubes. It is believed that those where the dwellings of cruel spirit reside and will scare to death anybody that frolicked and bumped into them. It seems like a sacred spot that looked like a guardian of the place or maybe it has a different function at that time because the word ‘Djinn’ – or unseen spirit – was completely was non-existent during the Nabatanean because they believed in different form of spirits. 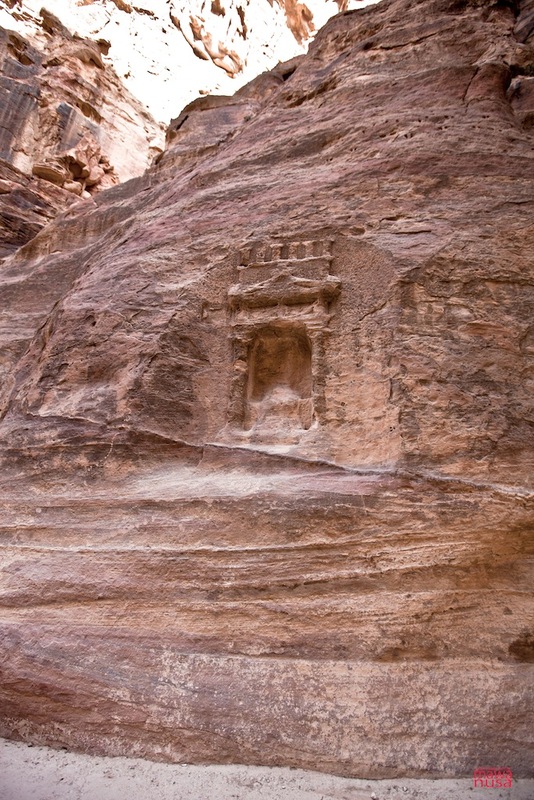 After few meters from the Djinn Blocks, on the left hand side there are sand stones carved in two levels. 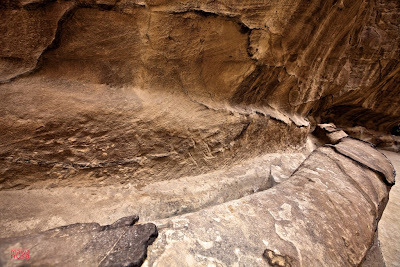 In the lower level there are small hollow entrance, this is the Tomb of Serpent – it was called so because there appeared in one of the walls bas reliefs two snakes or serpent that looked like acting as if attacking a four footed animal. Or maybe it has a different name during the Nabataean time. The upper lever is also nicely carved similarly to a group of four tips of Egyptian obelisks – as it is called the Obelisks Tomb. This is about a four-meter high structured rock carving that is very unique, with different type of carving and very obvious because, probably it was carved after the invention of Egyptian obelisks and they started to interact with Egyptian pharaonic rulers in different times to establish their relation or trade transaction, no one knows. 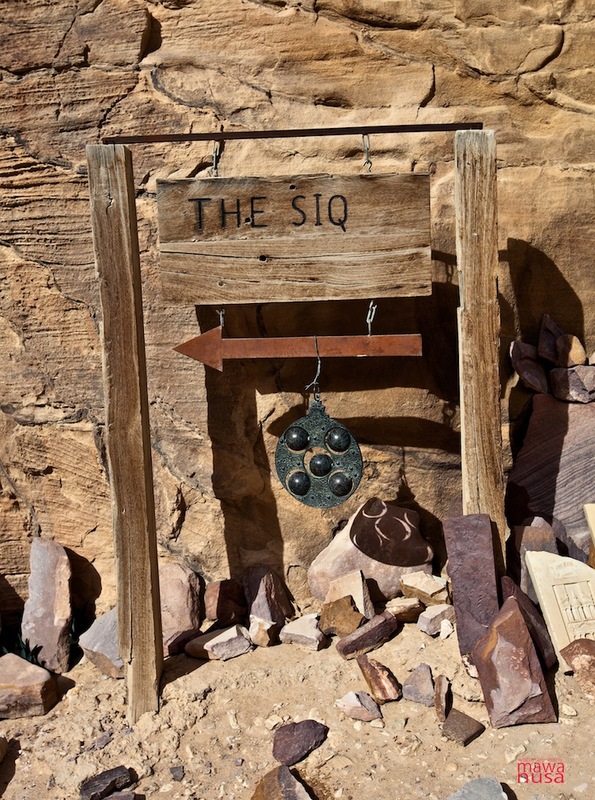 After these two interesting sites, we continue to move on to reach the beginning of the Siq, there were many small to medium size tombs which is also amazing to discover. 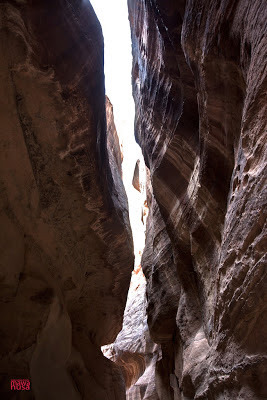 Just before entering the canyon, there was a tunnel to keep the water flowing from the upper water source to the other side of Petra water bank that was used for irrigation and at the same time to keep Petra from flood water, while the water flow under the constructed bridge by the smart Nabataean engineers. 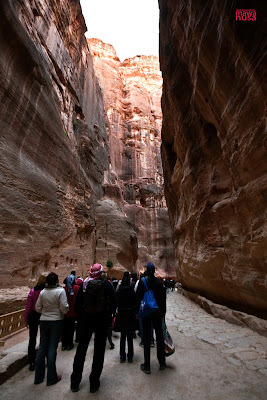 Now we enter the shady colorful canyon of the massive colonnade passage way or the only bypass road of Petra. 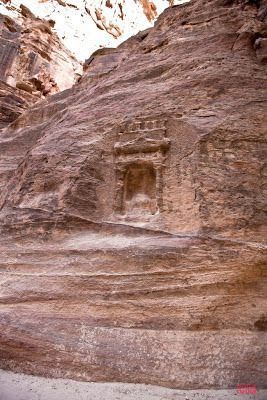 I noticed there was a block of stone probably for the guard as a checkpoint for those who will enter Petra’s inner bypass street of the Siq. This passage is really spectacular. The length of the passage is about 1½ kilometers long with amazing ravine embedded between two great natural walls of about 180 meters high but in some area this maybe shorter. This natural access is about 3-4 meters wide following the caste of the natural canyon shape, winding but interesting. This part of Petra is cooler than the other parts because a higher wall prevents the sunshine from coming in. On the way you can see numerous carvings, ruin of statues, arch, some inscriptions on the walls. The water flow canal system was also maintained in this area on both sides of the wall skirting. In some areas you still can find the original flooring and visible in few parts of the Siq. As you passed this area, there are some dark areas and the way take you to many turns, and you will be finally amazed seeing the most beautiful monument in Petra area, El Khazneh. 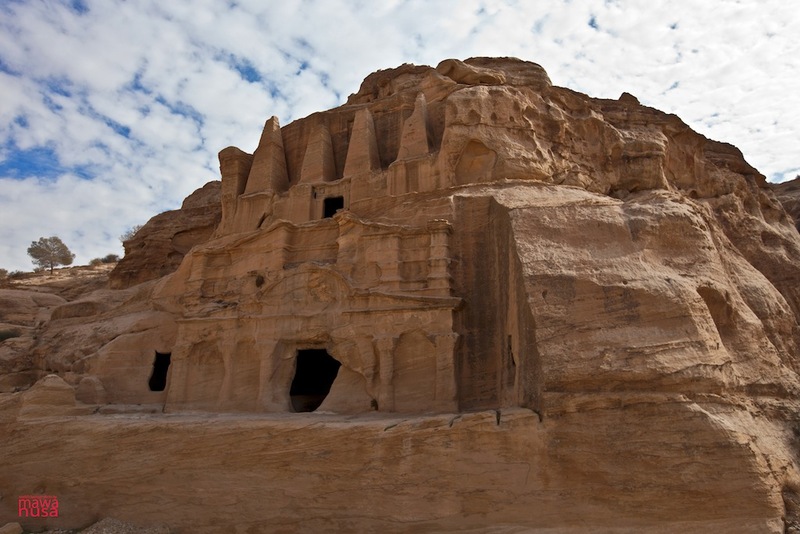 El Khazneh or Treasury is the most famous and elaborate rocky-cut monument building in Petra. The beauty, the charming, the character, and the most fascinating thing is the brilliant position of location of this monument, as soon as you reach this point you will feel really breathless that such grand and majestic structure, leave a moment of enchanting moment life experience. This is the most beautiful ancient monument I have ever seen. El Khazneh is about 39.6 meters high and 28 meters width. Because of the structure of the monument that is that carved on the well preserved stone, it allows the viewers to see the grandeur of the ruin for centuries. We can write unlimited description for this magical ruin as well as admire and imagine the time when the building has just been completed, of how beautiful it was. 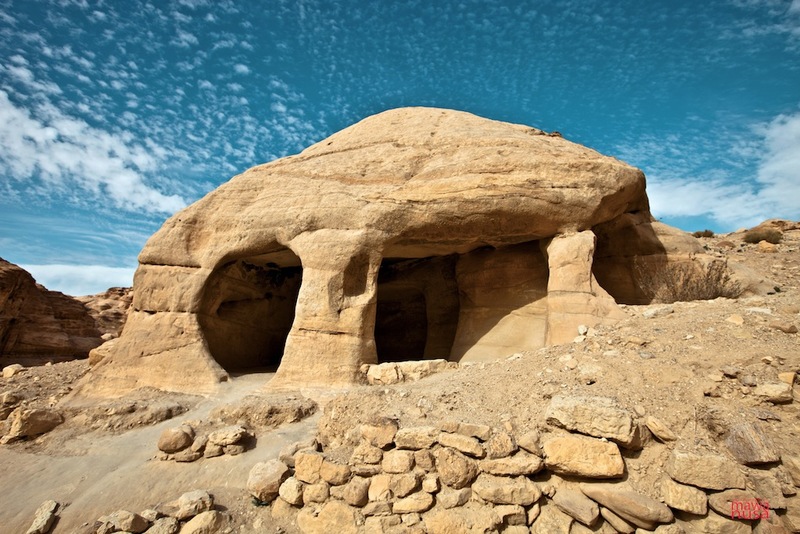 Lots of sacrifices and hard work of Nabataean peoples put to this grand project, together as team work of amazing artists towards reality of a dream! 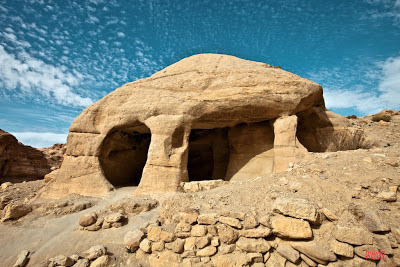 If we view this El Khazneh surrounding by rock tombs, probably this has been utilized as a Royal sepulcher, but until this time it is still a controversy. 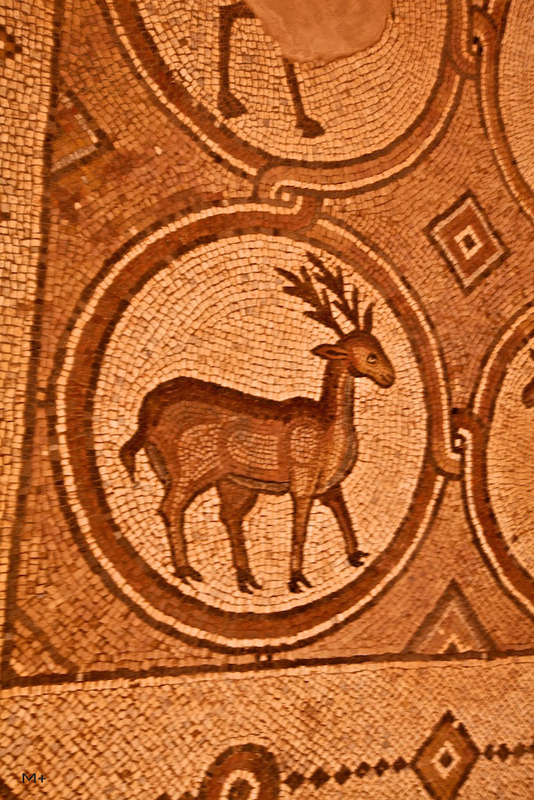 The service and faith of the believer of that era allowed them to create art out of imagination that last forever. The building has six pillars that supported the upper store castle-like carving and has an entrance with steps toward the inside of the most sacred main hall. 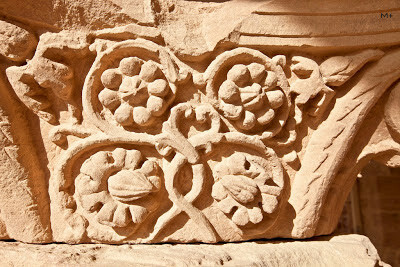 The details and the elegant carvings and decorations are to add significant value to its appearance. After this incredible monument, we walked the outer Siq and we pass by the many beautiful rock carvings around the triclinium but mostly tombs carvings. 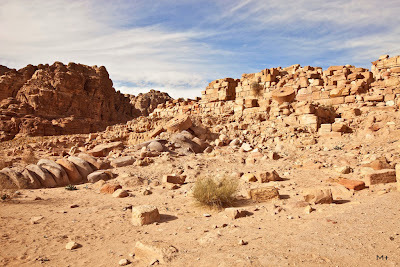 This area looked like a village with hollow rocks on the right and left hand side. 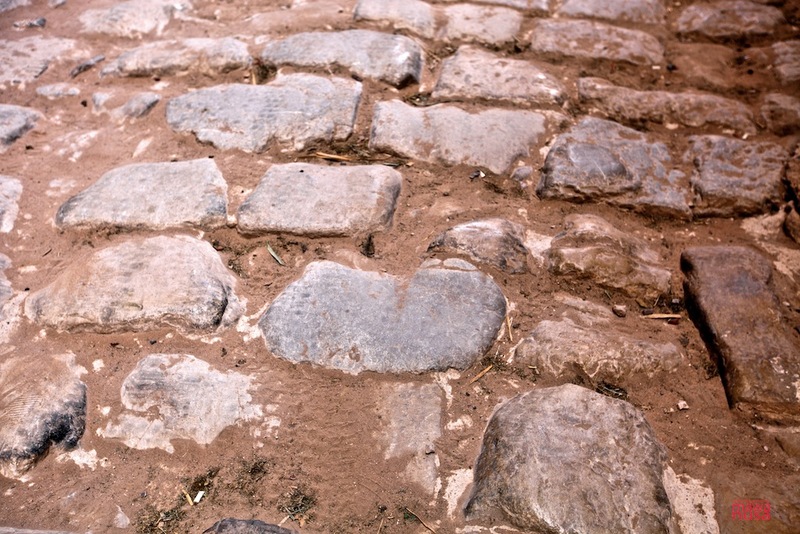 The passage was a winding down route, feels like a never-ending turning to your left and right. Here, the rocks were hanging high. A bit further on your left side you will be surprised to see suddenly a beautiful enormous hollow theatre sculptured into solid rock with very precise measurement completed with circular sitting style public rock chairs (theatre style of course) for the audiences and in front has an entrance stage for performers. 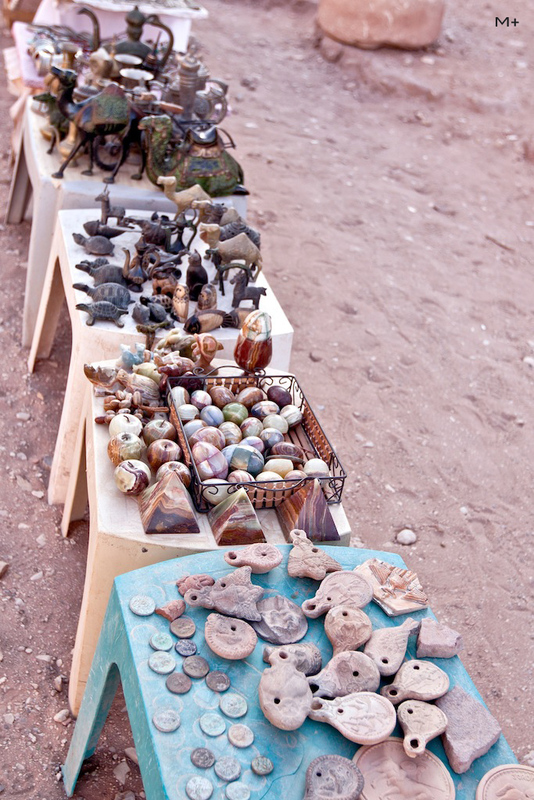 This place seems like a central for art and cultural show or special events – pretty amazing! Walking along the Façade Street, especially on the right hand side, there were many important tombs for Urn, Silk, Corinthian, Palace, Sextius Florentinus, etc. Some of the carvings here looked like were carved on top of each other. From here I walked to the Church and Temple of Winged Lions. Then I went down to the front of the Grand Temple. From the ruins of the temple we can see that the great civilization has truly existed here. Unlike the Egyptian ruins, the pillars are mostly cylindrical type of pillars with a very smooth finish. 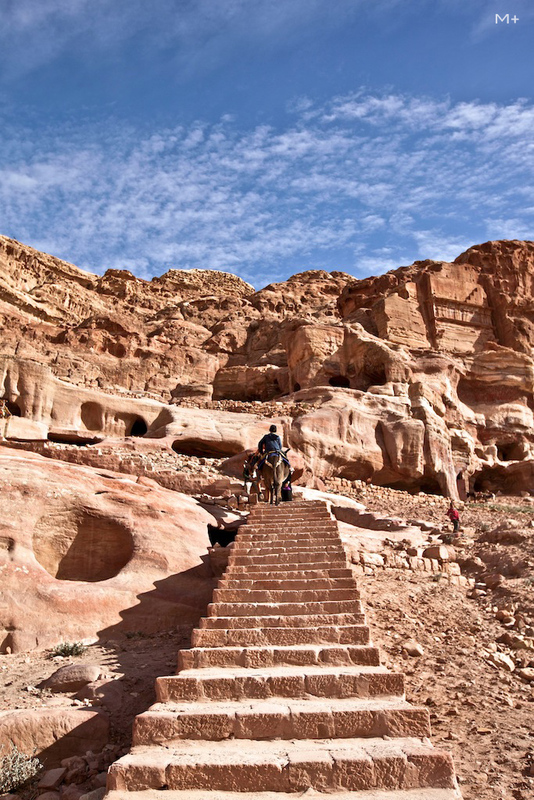 This temple must be the most sacred place in the Nabataean and must be the most visited site during that era, as a place for center of pilgrimages and worships. After the tour of this last temple, I was finally feeling so tired and I cannot walk anymore! But my mind would like to explore more and more, I would like to discover the entire Petra but I feel I have no more energy to walk farther. 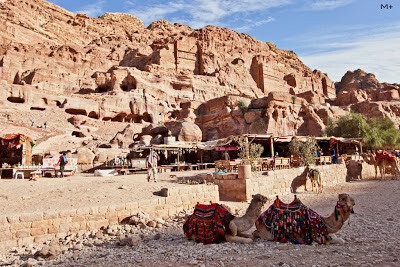 I wish I could stay for a few more days here to explore Petra, or return in a better shape next time with better itinerary. I have taken enough photographs until here. Then I finally took a cart to go back to the main entrance. 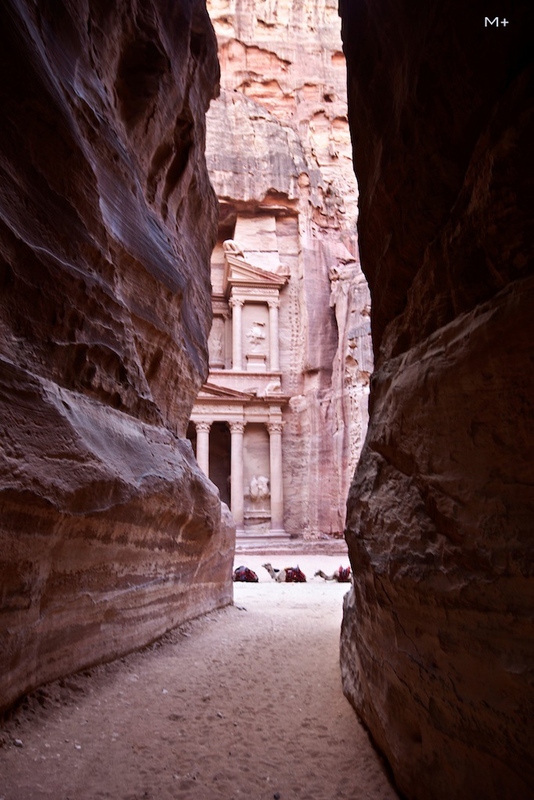 Bye for now Petra…until next time. Petra was declared by UNESCO as a World Heritage site since 1985 and was also voted as New Seven Wonder of the World since 11 November 2011.